Fujitsu have taken control of the power on the Stylistic Q702 hybrid in order to stop it overheating and it means that instead of a guaranteed minimum nominal clock speed you’ll get about 1.3Ghz average clock rate under load. That’s nearly 50% less processing power than the best designs on the same processor and yet Fujitsu fails to point this out on their website. Advertising a 1.8Ghz-2.6Ghz CPU and then restricting that to very short duration work is somewhat misleading in my opinion. The Q702 is likely to have been designed with what’s known as configurable TDP (cTDP) which allows the designer to set the CPU to a lower power profile, effectively locking out any long-term high-clockrate CPU or GPU in order to keep thermals under control. Fujitsu have their backs covered of course because the CPU will indeed momentarily speed-up above the nominal 1.8Ghz before it quickly drops down to sub 1.8Ghz levels. 1.3Ghz is about the average clockrate I’ve seen under any CPU loads. For the record, I have seeen brief moments of 2.6Ghz clockrate. 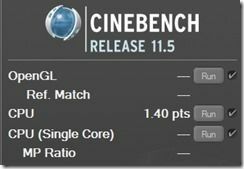 I tested Cinebench 11.5 and got scores of 1.63, 1.4 and 1.57 as results. For comparison, the Lenovo Twist, at half the price, turns in a 2.33 score. It’s not just the Q702 that does this; The Acer W700 does a similar trick according to forum reports. You’re likely to see this on other Core tablets too. As predicted, it’s confusing for customers. It doesn’t just stop at tablets either. The Samsung Series 5 Ultrabook has Turbo Boost locked-out under battery power although at least that one can sustain the nominal clockrate. There are a couple of interesting points to note about the Q702 though. Firstly, I used it for a full work process while at MWC last week and I didn’t notice this issue – A reader pointed it out to me. My high-load jobs were using Intel Quick-Sync Video though so maybe that’s not impacted as hard as the CPU is. Secondly, by keeping the clock low you’re capping the power usage on the CPU which leads to longer battery run-times and, in theory, a cooler and more efficient system. The Fujitsu Q702 certainly has some great battery life figures. The moral of the story here is that if you’re looking at very small and tight Core-based designs in 2013, you need to be aware of thermal limitations. All Ultrabooks will vary their Turbo Boost according to temperature so that’s to be expected. Some will turn of Turbo under battery power and the Fujitsu Q702 TabletPC (it’s not an Ultrabook) highlights the extremes where clocks are reduced below nominal, and expected speeds. Thank goodness for independent reviews and good comments! Thx DaDude! I definitely think this needs to be documented up front by the manufacturers but I also think this is going to become more and more the norm. The i series processors ability to dynamically overclock and shutdown cores was the start but eventually I see the performance characteristics being more and more dynamic. As you mentioned the w700 does this, the upcoming thinkpad helix downclocks when your running on the tablet only and lets the cpu stretch its legs a bit when connected to the dock with an active cooling solution. Its not even limited to the ultrabook realm, tests on the new samsung chronos found models with the 8870 are throttling the cpu and gpu under load to a limited degree although its unclear if that is heat or PSU related. Jumping ahead a few years I could easily see the benefits of i series and atom series processors becoming one solution that dynamically adjusts its performance characteristics based upon heat and available power. This is an interesting idea. Could Intel do the big.LITTLE thing with Core + Atom on the same device? Helix, of course. I forgot that one but at least it has the potential in the docking scenario. It won’t work in practice. It’s especially difficult in ecosystems such as Windows where hardware and software configurations matter GREATLY and options numerous. Some people in enthusiast forums report that they have to disable EIST so they don’t see micro stutter in games and applications. Imagine how bad it would be if the lower end of the performance equals Atom. I don’t see why you can’t just fix your application to run at certain frequency instead(some applications indeed do this). It would be a far more elegant solution. Will this micro-stutter be noticeable in non-gaming scenarios? SpeedStep has some switching latency and I assume Atom to Core will have a larger one but would that latency matter that much? With Intel integrating a lot of components into a single chip plus having highly integrated peripheral components like in Clover Trail, why won’t it work? There are already hybrid graphics systems using separate chips. Ya, OEMs should disclose this at least in their specs/datasheet documents if they don’t already do. Anyway, have you felt that the Fujitsu seemed to noticeably struggle when compared to other notebooks/tablets? If not then this downclocking is probably worth it for the battery life for my non-CPU intensive tasks. As I mentioned, I didn’t notice it during a week of trade-show work but I rely on Quick-Sync for that, not CPU. In general use I don’t see much difference. The short-term Turbo Boost is probably enough for fast web-page loading, for example. The battery life advantage is something I value. Maybe Fujitsu will address this with a bios update. I would be glad to trade a hotter case/tablet with more processing power. 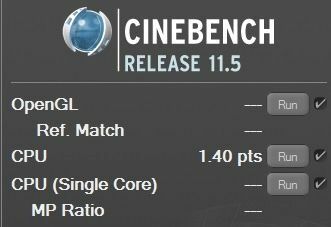 The results of the Cinebench are just hilarious. Keep us updated on this and if Fujitsu will reach out to you about the problem. I will try and ask them too, when I’m at their booth at Cebit. Would be useful if the user was able to decide whether he prefers more battery life and less noise or the contrary with more performance. If they disclose it then I don’t see a problem. If they have power settings to control it then that’s even better. Of course, it can only be configured up to a certain threshold before hardware damage. Not sure if these devices are already clocked to highest possible without damage. Will be very interested to see how the Helix stacks up here. Hope you continue posting this analysis. Maybe worth waiting for Haswell. Some theories presume that it would work when everything is perfect. Except its not. Nothing is. Things like big.Little relies on software optimization to work. You need to have the application aware of it. It’s probably easier in Android where all programs are basically apps that come from the App store. They have certain criterias they need to meet, unlike developing for Windows. Versus an alternative where you can just downclock the CPU to 800MHz or something. 800MHz Ivy Bridge would probably beat 1.6-1.8GHz Atom anyway. Right now it seems even at 800MHz, Core products use too much power, but that gap should decrease substantially in the future. It would be then easier to just program to cap the CPU at 800MHz rather than going through the trouble to create a asynchronous setup with all its complexities. Why must applications be aware of them? Isn’t a big.LITTLE setup seen by the OS as just different voltage/frequency scaling steps? If all the big and little cores are simultaneously usable then the OS/drivers/scheduler need to be modified. One thing that may limit Intel from adopting this, to me, is that the Atom and Core chips must have the same instruction sets which they don’t. Also, it just seems like a brute force solution of just throwing more silicon at the problem. If its treated as mere voltage/frequeny steps, there would be no guarantee that the small core would be running at all. You can see it by monitoring CPU frequency when you are doing light load tasks like web browsing and even video watching. It spikes up for the time it requires the processing speed before it goes back down. That’s also the logic for Turbo Boost in thermally limited scenarios. Even though that it can’t be maintained for long periods of time, the added speed gives you the responsiveness. It’s not physically voltage/frequeuncy steps but that’s just how it’s presented to the Linux kernel. The low end slots are mapped to the little CPUs and the higher ones are for the big CPUs. The CPU scheduler doesn’t need to change. It’s transparent to the OS.